It looks like Overwatch’s newest hero might be who—but not what—we thought. Fans speculated that the first-person shooter’s 28th hero could be Hammond, a monkey companion to the genetically-engineered gorilla Winston. So it came as a surprise that Overwatch just released Hammond the hamster, who goes by “Wrecking Ball,” onto the game’s public test realm this afternoon. [Update—2:30 pm ET]: This post has been updated with new information about Wrecking Ball. Entering the fray, his large health pool and shield-generating capabilities give him resilience when initiating and finishing battles. If that wasn’t scary enough, he can climb and swing on surfaces using his Grappling Claw and perform Piledrive, a devastating ground smash, to enemies below. In addition to setting up Piledrive, Wrecking Ball’s Grappling Claw enables him to reach top speed. Top speed increases his basic movement speed, damaging and knocking back foes in his path. His ultimate ability Minefield is just as versatile, allowing him to set a trap and control routes, or simply trigger a large area-of-effect explosion for enemies in the immediate vicinity. Wrecking Ball’s backstory is pretty, uh, different from other heroes’. Years before the events in Overwatch, Winston and his fellow moon-based test subjects rose up against their captors and took over the Horizon Lunar Colony. Winston escaped. Recently, fans learned that there was another escapee named “Specimen 8,” who they noticed was listed as “not found” on one of the Horizon Lunar Colony map’s monitors. This is Wrecking Ball. It turns out that he attached his escape pod onto Winston’s and crash-landed near Junkertown, Australia, where the heroes Roadhog and Junkrat reside. He upgraded that pod into a dangerous, sturdy mech. Players knew Winston had other primate companions, so many assumed that Specimen 8 would be one of them. 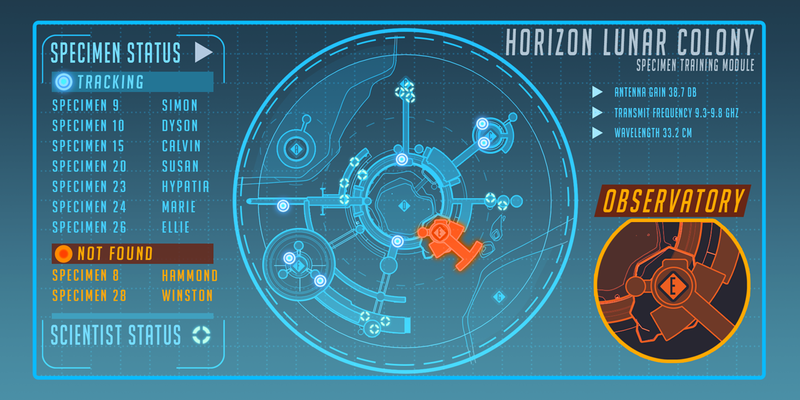 What remains of Wrecking Ball on Horizon Lunar Colony is some status information, a room he might have lived in and an escape plan involving a spherical ball—not a lot that points to “rodent in a robot”. Over the last few days, Blizzard teased the upcoming hero on Twitter with a gritty, back-alley location with graffiti that reads “No Bots” and “Horizon” under a monkey—which, to many, indicated that Hammond was coming and that he was likely a primate. This morning, Overwatch continued their drip-feed of information with a surprising reveal: a video of a hamster in a mech. Huh. Okay! Until this afternoon, fans were unsure of whether Hammond and the hamster character were one and the same. However, yesterday on the Overwatch subreddit, a player convincingly put together small clues they found on the Horizon Lunar Colony map. Evidence suggested that Hammond lived in a cage (unlike Winston, who slept in a bed), ate carrots, traveled in a ball and could move through the ventilation. Game director Jeff Kaplan told GameSpot last year that the Overwatch team once prototyped the hero “jetpack cat,” but didn’t include it in-game because it went “too far.” Looks like you had a change of heart, buddy.